By mating a Russian howitzer with a locally built tank chassis, India was on the verge of developing its own long-range artillery. But suddenly and inexplicably the new gun was scuttled. India’s ambition to become a great power has never been matched by its willingness to spend hard cash on its military. The previous government in particular ran defence preparedness into the ground by keeping the military starved of operational funds, with A.K. Antony probably deserving the title of Pakistan’s best defence minister ever. The critical howitzer shortage facing the Indian Army is a glaring example of the Indian leadership’s cavalier approach towards defence. While New Delhi splurges on shameful extravaganzas such as the Commonwealth Games, the Indian Army has not purchased a single artillery gun since the Bofors scandal broke in the late 1980s. Artillery is a key element of warfare. For the decisive Battle for Berlin in 1945, the Russians threw a total of 41,600 guns and mortars at the Germans. Alex Popov of the 5th Shock Army wrote: “The amount of equipment deployed for the Berlin operation was so huge I simply cannot describe it and I was there.” Marshal Georgy Zhukov wrote in his memoirs that it was the rain of three million shells that broke German resolve to hold on to Berlin at all costs. “As prisoners later told us, the great artillery barrage at night was what they had least expected,” he wrote. Similarly, in the 1999 Kargil War it was the Bofors 155mm gun that sent the Pakistanis scurrying from their positions in the high mountains. Because of its long range, accuracy, high rate of fire and mobility, the Indian Army was able to take out Pakistani positions quickly based on real time intelligence inputs. Despite the critical impact of artillery systems in war, India hasn’t replaced the over 200 (of the original 410) Bofors guns that have been lost due to attrition and cannibalisation. But even as the bureaucrats and politicians fiddled, the army brass resorted to Indian jugaad (innovative fix) in order to keep the artillery forces battle ready. Going by the adage that the army fights with the weapons it has rather – than the weapons it wants – the Indian Army asked the Defence Research & Development Organisation (DRDO) to use available assets to develop a self-propelled gun (SPG). In order to fulfil the interim and immediate requirements of the army, the DRDO’s Combat Vehicle Research & Development Establishment (CVRDE) developed an SPG by mating the Russian built M-46 130mm howitzer with the Arjun MK-I tank chassis. This new artillery system, which was on show at Defexpo 2014 is known as the Arjun Catapult MK-II. The Catapult has side and front armoured walls protecting the gun compartment, providing the crew with armour protection of STANAG level II. Its main weapon, the M-46, was originally a manually loaded, towed 130mm howitzer. Manufactured in Russia in the 1950s, it was one of the longest range artillery systems around, with a range of more than 27 km. But curiously, after 100 of the Arjun Catapults were produced, the army did not ask for further enhancements to the system and today India continues to seek high calibre artillery systems from foreign vendors. Because of the army’s about turn, the DRDO team working on the gun has lost development continuity. Weapons get better with each successive iteration, and in fact the Arjun Catapult MK-II is an improvement on the Catapult MK-I fashioned in the early 1980s by mounting the M46 gun onto the Indian-built Vijayanta tank. There were other spinoffs from the project. Private defence contractors like Tata, L&T and Bharat Forge were involved in locally upgrading the M46 guns to 155mm, which increased the range from 26 km to 39 km. These private players were also developing their own 155mm howitzers in collaboration with overseas defence companies, while also collaborating with the DRDO’s Armament Research & Development Establishment in Pune to design a 155mm Advanced Towed Artillery Gun System with a 50-km strike range. All plans were nixed by the cancellation of the Catapult and the new government’s decision in November 2014 to purchase 155 mm guns with a range of 40 km under the “Buy & Make Indian” programme. The plan is to acquire 814 guns for the Indian Army – 100 would be acquired off the shelf while the remainder of the 714 guns would be made in India. So instead of developing a gun with a 50 km range, the army is shooting for an artillery system with a much lower range. It happens only in India. It doesn’t take a rocket scientist to figure that the only people to gain from the DRDO’s failure are foreign manufacturers. Indeed, it is intriguing that DRDO projects such as the Agni series intermediate range ballistic missiles (which are banned from the international export market) have been extremely successful, while others such as tanks, aircraft, helicopters and short range missiles (all of which are readily available) are rejected by the defence forces for not being up to scratch. But then how can any weapons platform attain world class standards if it is not accepted by the military, if the designers do not get feedback, if the engineers and scientists are demoralised. The first generation of any weapon will have faults because weapons are tested in extreme environments. To repeatedly fail them at the first sign of trouble points to sabotage. For, let’s be clear about one thing. The Indian Army’s primary enemy is the Pakistan Army, not the US Army. We do not need world class weapons to fight a corrupt, slothful and incompetent army that has lost four wars against India. We need affordable and rugged weapons that can be produced in large numbers and easily replaced during wartime. And think about it. If India can send a successful interplanetary probe to Mars, discover water on the Moon, build nuclear powered submarines and develop supersonic missiles such as the BrahMos, then the rejection of the home made Catapult is clearly suspicious. 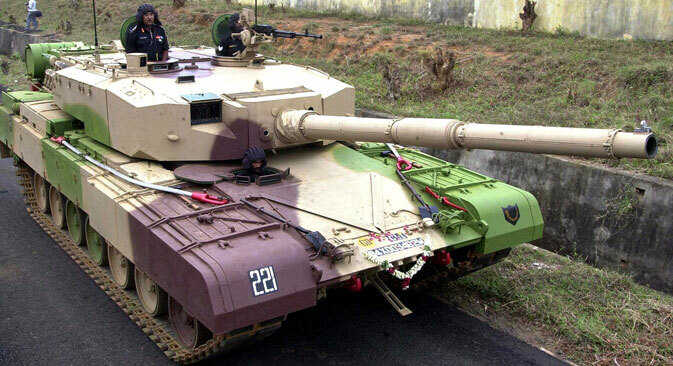 Perhaps the dodgiest case is that of the Arjun tank, which has been under development for nearly 40 years. In 2008 the DRDO had to install a black box in the indigenous battle tank following an alleged attempt to "sabotage" its engine. The instrument was installed after the Indian Army termed the winter trial of the Arjun tank a "failure". Nearly every weapon produced by DRDO has been rejected by the defence forces, forcing the government to release funds for imports. Take the Augusta Westland scandal. Initially, former air chief marshal S.P. Tyagi was under investigation for allegedly tweaking the technical requirements of VVIP helicopters. Later it transpired that the specifications were changed prior to Tyagi’s tenure on the orders of Brajesh Mishra, the National Security Adviser, who was reporting directly to former Prime Minister Atal Bihari Vajpayee.